When I entered the ToysXL store I was greeted not by a Nintendo staff member, but by an unsuspecting lady who was giving out folders of 15% reduction of all prizes. 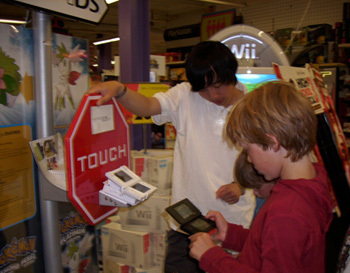 I couldn’t care less about that and went straight to the small cardboard setup where Shaymin was downloadable. No Pikachu or other mascot in sight. I had a lot of copies of Diamond from people who wanted a Shaymin as well, so I started downloading the green hedgehog of gratitude. After a few minutes, an enthusiastic Nintendo representative appeared. 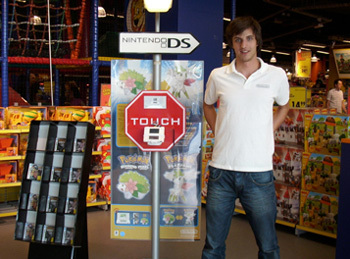 After gaining the last few Shaymins, I got set to leave and made a picture of the Nintendo guy with the ‘stand’. He stopped me and I received a nice looking Giratina bookmark.